A DISTURBING study of mental health patient and carers’ experiences at Northern Ireland’s accident and emergency departments raises serious questions about the treatment and support given to people presenting with self-harm or suicidal thoughts. 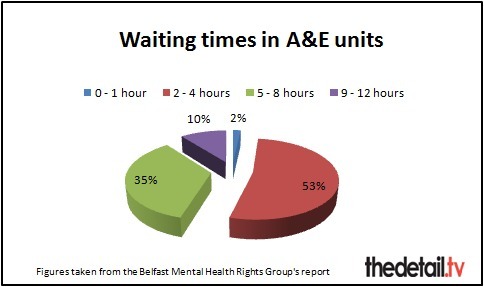 The report by the Belfast Mental Health Rights Group (BMHRG) was launched today (May 16th) and contains evidence collected over the last two years from people who have attended A&E in mental health crisis. BMHRG is a group of service users, carers and families bereaved through suicide. Members come from all over Belfast but particularly from north and west of the city where suicide rates are particularly high. They collected the views of 58 people who had either been to A&E in crisis themselves or who had supported someone else through a crisis. The Detail revealed earlier this year that more than 220 people known to mental health services died in suspected suicides in Northern Ireland over a two-year period – click here to read our previous articles. The deaths we reported on occurred between April 1 2009 and September 30 2011 and appear to indicate a dramatic increase in suicide deaths of people suffering from mental health problems compared with statistics collected between 2000 and 2008 as part of a national confidential inquiry. BMHRG’s report – ‘Services at breaking point: fighting to have our voices heard’ – highlights long waiting times, patients being left out of decision making and many individuals in mental health distress being discharged without details of important follow up appointments. Grace Cassidy, a carer and member of the BMHRG, said the group’s findings show the need for change in a system at breaking point. She said: “We have monitored people’s experience of waiting times, whether people are informed about their treatment and if people are receiving proper follow up care and the results show that things have got worse instead of better. “Some of what we have seen is truly frightening and there really is a need for the Minster to sit up and take notice. “I know from my own experience with my son how badly things can go wrong when proper and timely follow up care is not provided. The report was produced as part of the BMHRG’s work to achieve change in services. Long hospital waits were highlighted in the report and the group feels this issue needs serious attention. In 2010 45% of people surveyed had to wait over four hours in A&E to be treated and admitted or discharged by a doctor. In 2011 the situation worsened slighty with 46% of those questioned waiting over four hours. 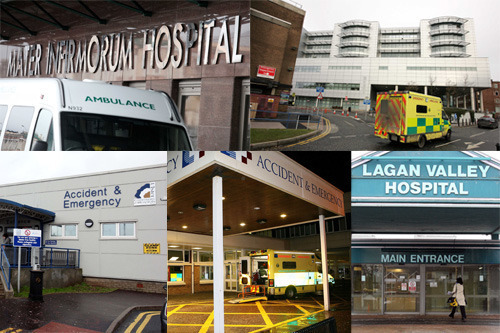 Local policy states that from April 2010, 95% of patients attending A&E departments should be treated and discharged home or admitted within four hours of their arrival in the department. On person told the researchers that he arrived at hospital at 6pm and sat waiting until 3am. He said the nine hour wait made him feel frightened. Some people told BMHRG that they left hospital because they “couldn’t take it anymore”. One man said that during his nine hour wait in hospital he felt like he was “in the way” and was treated as less important because he had a mental illness and not a physical injury. In 2010, BMHRG campaigned successfully for the ‘Card Before You Leave’ scheme to be launched. Anyone who presents themselves at A&E with self-harm or suicidal thoughts and is deemed low risk and discharged should now receive the details of their follow up appointment before they leave hospital. However, the research by BMHRG shows that this is not always the case. In 2010, 13% of people who had been to A&E in mental health crisis and were in need of follow up care received a written appointment on discharge. This rose to only 15% in 2011. This means 85% of people in crisis left hospital last year without adequate support. Another service user who had spent 12 hours waiting to be assessed in A&E asked about a discharge letter and was told by a nurse that it would be posted out to him. This was despite the fact that no one had taken any information about where he could be contacted and the fact that he had no permanent address. The man said this had made him feel “angry and disrespected”. In 2010, only 20% of the people surveyed said they were happy with the level of information they received about their treatment and the care pathway. By 2011, this had risen slightly to 29%. Participation and the Practice of Rights (PPR) supports disadvantaged groups to assert their right to participate in social and economic decisions which affect their lives, including the BMHRG. Kathy Gilliland, a mental health service user and member of the BMHRG, called on Health Minister Edwin Poots to look seriously at the issues raised in the report and to work with the group and all service users and carers to improve the situation. She said: “What we need now is real action. We’ve collected the evidence which shows just how bad things are at A&E. We look forward to working with the Health Minister to ensure that the situation improves. We asked the Department of Health for a comment from the Health Minister on the report – which he received earlier this week. A department spokeswoman said the Minister has yet to consider the findings and recommendations of the report.